Coca Cola crowned the 2018 World Cup CHAMPION! World Cup 2018, the month-long global football extravaganza came to a thrilling end last week, with France winning the championship for the second time. It was also a world cup of firsts in many ways — in technology (Video Assistant Referees/VARs), in new audience reach for FIFA (through Russian VKontakte, as well as to China on Weibo and WeChat) and in digital engagement (the most engaging World Cup). 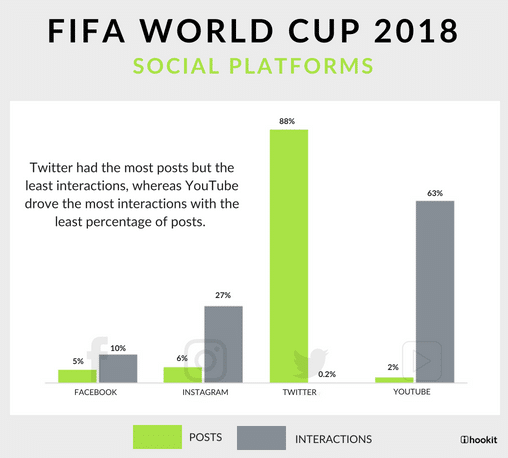 Now that World Cup Russia 2018 is done and dusted, here is a look back at the SOCIAL MEDIA WINNERS of the World Cup. Time period considered was the entire duration of the World Cup, from June 13, 2018 to July 16, 2018. Multiple brands competed for audience attention on one of the most watched sporting events in the world, chief among them being FIFA’s official partners/sponsors and kit sponsors of competing teams. FIFA Partners: At the World Cup Russia 2018, there were 7 sponsor brands in this category, with an estimated sponsorship cost of 32 million Euros (37 million USD). Regional supporters: This World Cup had 7 regional supporters from the European and Asian regions, primarily from Russia and China. 8 brands sponsored the 32 teams that competed this year, with Adidas sponsoring the highest number (12) of national teams followed by Nike(10). Other kit sponsors were German companies Puma(3) and Uhlsport(1), American manufacturer New Balance(2), English sportswear and football supplier Umbro(2), Italian sportswear company Errea(1) and Denmark based sportswear company Hummel(1). Coca-Cola has partnered with the World Cup since 1974 and has extended its partnership until 2030. 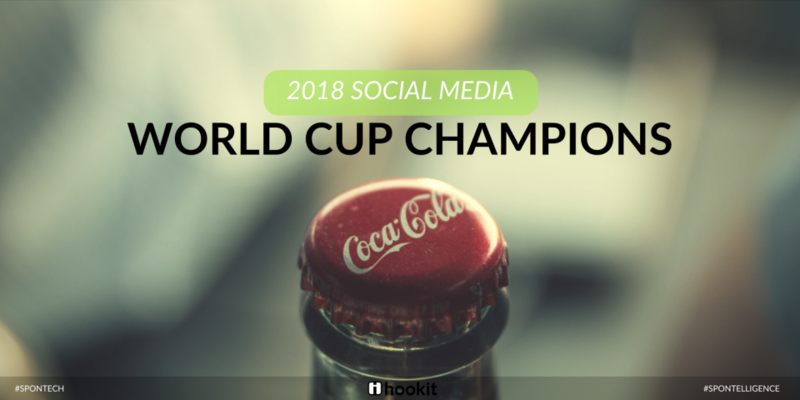 With 69M interactions across its social channels, Coca-Cola easily outperformed other FIFA partners and sponsors to claim top spot at the World cup 2018. 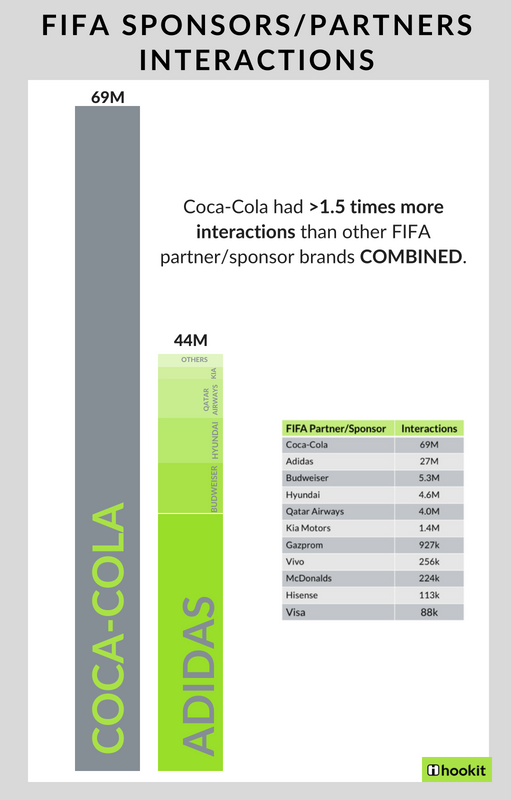 Social media interactions of Coca-Cola were 1.5 times more than the other official sponsors/partners COMBINED. YouTube was the primary driver of social media interactions for Coca-Cola with 90% of total engagement followed by Facebook with 8%. 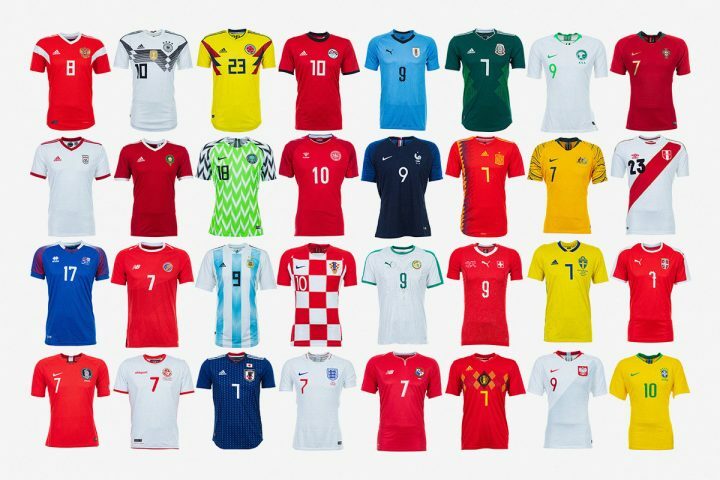 The global apparel giant sponsored 10 of the competing teams at the World Cup 2018 including finalists France and Croatia but was not an official sponsor of the tournament. Nike was highly successful on its social media platforms generating 29M total interactions, edging out competitor Adidas by 2M interactions. Instagram drove 76% of total engagement for Nike. Along with being the official partner of the World Cup, Adidas also sponsored 12 of the World Cup teams in 2018. Adidas takes the third place overall with 27M interactions across its social channels, with Youtube driving the most engagement (80%) followed by Instagram with 19% for the three stripes. 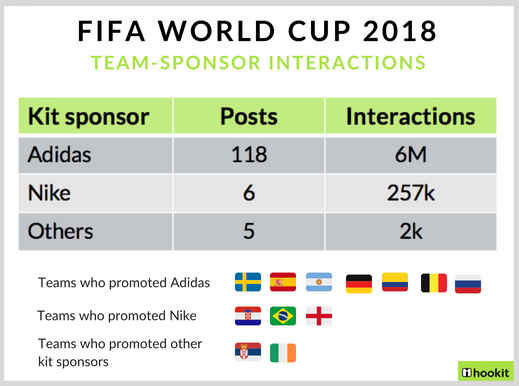 The German sportswear manufacturer sponsored 3 national teams during this World Cup and generated over 5.5M interactions across its social channels. 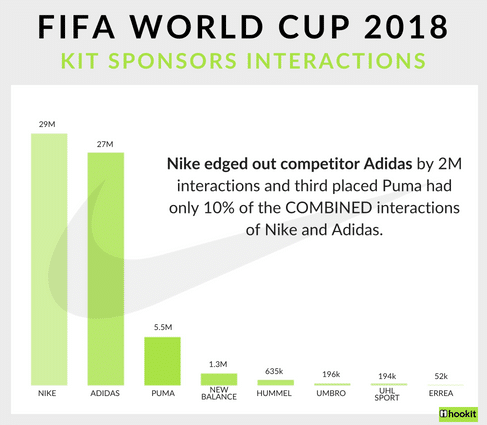 Although, it only had 10% of the combined interactions of rivals Nike and Adidas, it ranks 4th among all participating sponsor brands (official & kit sponsors), beating top tier sponsors such as Hyundai, Kia Motors, Qatar Airways and others. There was a marked Chinese presence at World Cup 2018 with seven companies– FIFA partner Wanda Group; World Cup sponsors Hisense, Mengniu and Vivo; as well as regional sponsors Diking, Yaeda and Luci. However, only World Cup sponsors Hisense and Vivo were active across the traditional social media platforms popular worldwide, and generated 369k combined interactions. 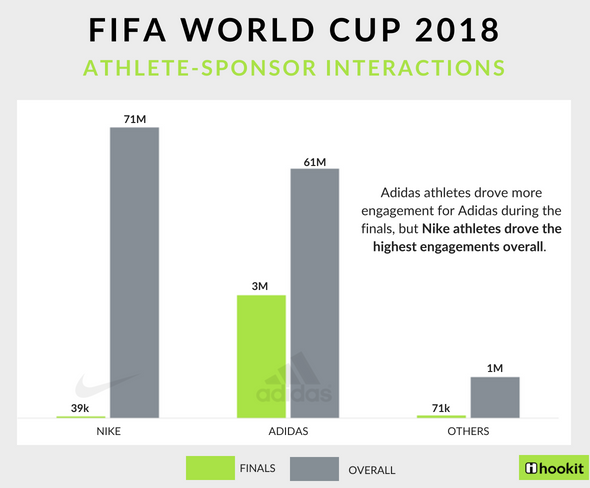 Athletes: During the finals weekend, although their national teams were sponsored by Nike, athletes sponsored by Adidas and Puma posted about and drove more interactions for their respective shoe sponsors. However, over the course of the tournament, although Adidas received twice as many promotional posts from its athletes, Nike had the highest number of engagements, thanks to the influence of Ronaldo. 2. Teams: Over the course of the tournament, only 12 of the 32 teams promoted their kit sponsors on social media. 7 of the 12 Adidas sponsored teams posted extensively about the brand, driving over 6M engagements for the German brand. Nike teams, on the other hand, only posted 6 times, driving 4% of that engagement. French stars Paul Pogba, Kylian Mbappe and Antoine Griezmann dominated the engagement rankings over the final weekend of the tournament. 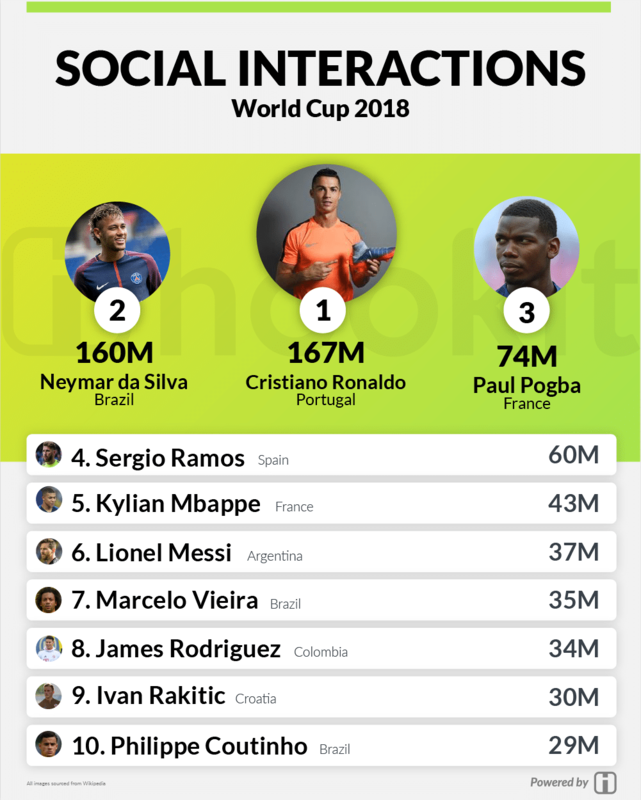 However, Ronaldo and Neymar were the top athletes through the whole tournament, both driving more that 2x the engagement of Paul Pogba, who came in at #3 on the most engaging list for the month-long tournament. France won the World Cup not just on the field but on social media as well, with 153M interactions across its social channels. 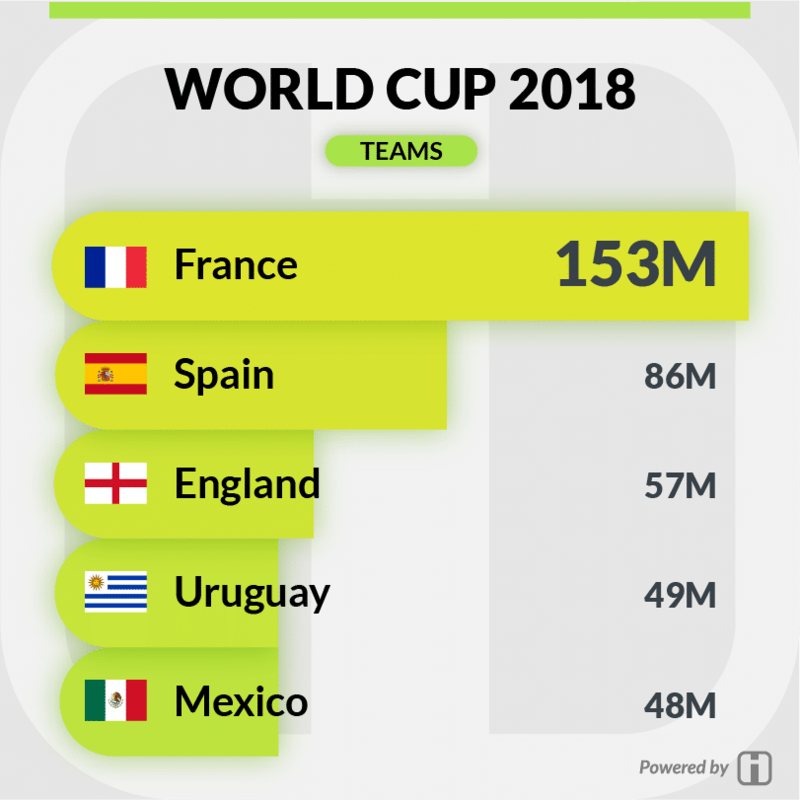 With nearly double the engagement of Spain and triple that of England, France took advantage of their success on the field with engaging content for their fans online as well.World Cup runner up Croatia, placed 10th among the national teams on social media interactions with 21M interactions across their social channels. 88% of the total posts made by brands were on Twitter, making it the clear social platform of choice for brands. However, it lead to only 0.2% of the total engagement. Meanwhile, YouTube generated the most engagement (63%) with the least amount of posts (2%) making it the most preferred platform of fans. Did your favorite athlete/team make it to the top? Let us know in the comments below! Want to drive the highest value for your sponsors? Download the handy guide detailing the best practices to be followed for maximum social engagement!